Shielding must provide a reliable electrical contact over wide deflection ranges while withstanding multiple mechanical flexures. While high strength copper alloys promise to hold closely to original performance specifications, certain considerations must be given to assure continued effectiveness. Even though installation and mounting are quite simple, some design geometry's must be properly oriented to the direction of contact engagement to prevent undue stress and possible damage. This is covered in detail under INSTALLATION GUIDELINES. From top to bottom: Bright Finish gasket, Bright Tin plated gasket, Enviroseal gasket. The designer should also consider the effects of galvanic corrosion when there is a dissimilar metals situation between the shield and the surfaces it comes in contact with. 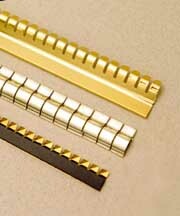 Long-term shielding effectiveness without degradation can be assured if proper steps are taken to prevent it. The three most common types of corrosion effects at the point of electrical bond are: (1) oxidation of metal surfaces, (2) galvanic corrosion of dissimilar metals, and (3) acidic corrosion during assembly; i.e., solder fluxes. To avoid degradation use as many of the following guidelines as possible. B.) Provide corrosion protection for the metal gasket. See plating alternatives below. C.)	Avoid dissimilar metals in contact. See galvanic compatibility chart below. D.)	Use combination environmental/RFI gaskets where practical; especially when designs dictate dissimilar metals in close proximity. See Enviroseal in photo at left.